MFA - Montclair School of the Arts at MSU, Montclair, NJ, 2005. The John Simon Guggenheim Memorial Fellowship, 2013. 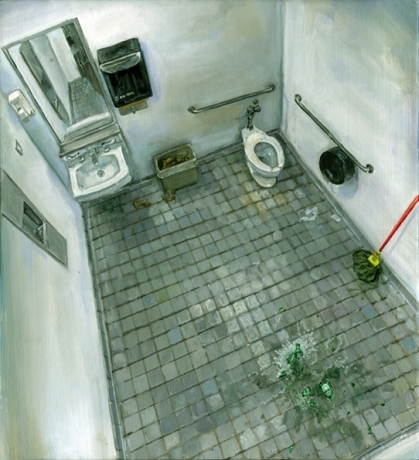 The Pollock-Krasner Foundation Grant, 2006. 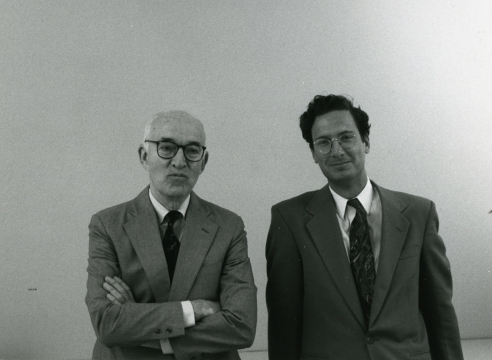 The Joan Mitchell Foundation Grant, 2005. Traveling to: Ringling College of Art and Design, Sarasota, FL, 2015 – 16. 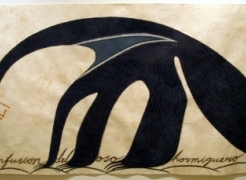 “Amer Kobaslija.” Arthur Roger Gallery, New Orleans, LA, 2015. 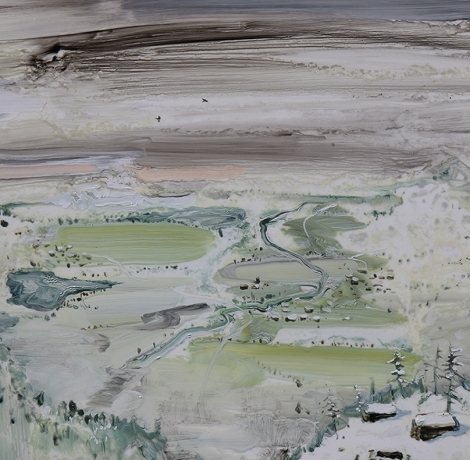 “Kesennuma, Japan’s Altered Landscape.” Rosa Lehrman Gallery at HACC, Harrisburg, PA, 2014. “Miniatures.” George Adams Gallery, New York, NY 2013. 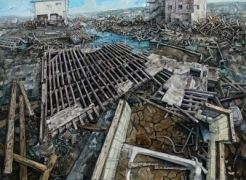 “One Hundred Views of Kesennuma: Paintings of Japan’s Altered Landscape.” George Adams Gallery, New York, NY, 2012. “One Hundred Views Of Kesennuma.” Schmucker Gallery; Gettysburg College, Gettysburg, PA, 2011. “(In) Significant Objects.” Rena Bransten Gallery, San Francisco, 2008. “Poetics of Space: New Paintings.” George Adams Gallery, New York, NY 2008. "The Newsstand Project." Honor Fraser, Venice, CA, 2006. "New Paintings." Finlea Gallery, Montclair, NJ, 2004. "Suburban Paintings." Haskell Gallery, Jacksonville, FL, 2003. "Drawings of Bosnia." Cummer Museum of Arts and Gardens, Jacksonville, FL, 1999. "30 Years: Frumkin/Adams - George Adams Gallery," George Adams Gallery, New York, NY, 2018. “Space, Place, and Order.” Rena Bransten Gallery, San Francisco, CA 2013. “Faculty Exhibition.” Gettysburg College, Gettysburg, PA 2012. 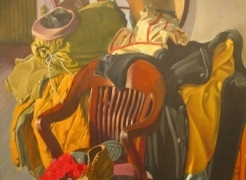 “Art of Collecting.” Flint Institute of the Arts, Flint, MI, 2011. “Art on Art” Adam Baumgold Gallery, New York, 2011. “Small.” Louise Ross Gallery, New York, 2011. “REAL(ist).” Ringling College of Art and Design, Selby Gallery, Sarasota, FL 2010. “Gallery Artists Summer Show.” George Adams Gallery, New York, NY 2009.“New / Classical.” George Adams Gallery, New York, NY 2010. “COOL: Summer Invitational Exhibition.” George Adams Gallery, New York, NY 2008. 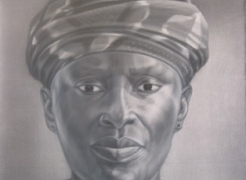 “Montclair Alumni Exhibition.” PPOW Gallery, New York, NY, 2007. "Dreams Take Flight-2007 Annual Auction." Pacific Academy, Anchorage, AK, 2007. "Views of Distant Lands." Cummer Museum of Arts and Gardens, Jacksonville, FL,1999. AMIRKHANI, Jordan. “Amer Kobaslija at Arthur Roger Gallery.” Daily Serving, May 2015. AMY, Michael. 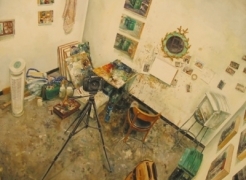 “Studio Paintings at George Adams.” Art in America, November 2006. AYERS, Robert. “Amer Kobaslija.” Reviews. ARTnews. May, 2011: p. 115. Illus. BAKER, Kenneth. “Unusual Self-Portraits, ‘Exceptional’ Photos.” SF Chronicle, 28 July, 2008. 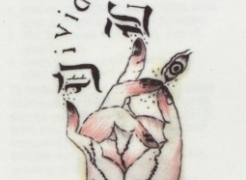 D’ARCY, David. “Nuclear Wave Cinema-and Art.” ARTINFO. March 12, 2012. GOMEZ, Edward. 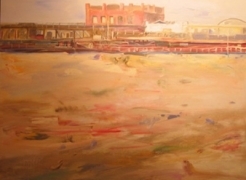 “Visualizing Disaster.” Art & Antiques, June 2012. GOMEZ, Edward. “Recalling Nature’s Furry Abstractly in Oils.” The Japan Times, Tokyo, Japan, December 2013. HEARSE, Emma. 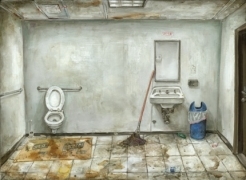 “Artist Amer Kobaslija Cleaning Service Couldn’t Make It.” NY Magazine, June 28, 2008. MORRONE, Francis. “Funk Art,' Psychedelia, and Post-Punk Sensibility.” The New York Sun, August 30, 2007. GOODEVE, Thyrza. “Vulnerability and its Vicissitudes.” The Brooklyn Rail, October 3, 2013. GRANT, Daniel. “Affordable Prices on Upswing.” ArtNewsLetter. January 22, 2008. MACK, Joshua. “Poetics of Space.” New York Time Out, June 20, 2008. MUSALLEM, Tori. "Mussallem: Elemental Show." ARBUS, Jacksonville, FL, 2002. O'HERN, John. 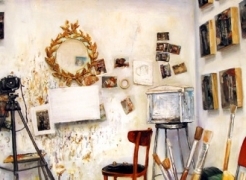 "The Studio as Muse, Workplace and Refuge. "American Art Collector, September 2006. RODRIGUEZ, Kathy. 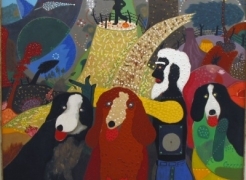 “Amer Kobaslija – Paintings.” New Orleans Art Review, July 2015. SMITH, Roberta. “Poetics of Space.” The New York Times, June 20, 2008. --- "Burning the Past." Movement Magazine, Jacksonville, FL, 2003. ---"Tragom Uspjeha." Peta Strana Svijeta, Chicago, IL, 2002. The Orlando Museum of Art has recently announced that Amer Kobaslija is one of ten artists artists for the 2019 Florida Prize in Contemporary Art. Organized and curated by the Orlando Museum of Art (OMA), the Florida Prize exhibition brings new recognition to the state’s most compelling and progressive artists. Artists range from emerging to mid-career, and each is engaged in exploring significant issues of contemporary art and society in original and visually exciting ways. 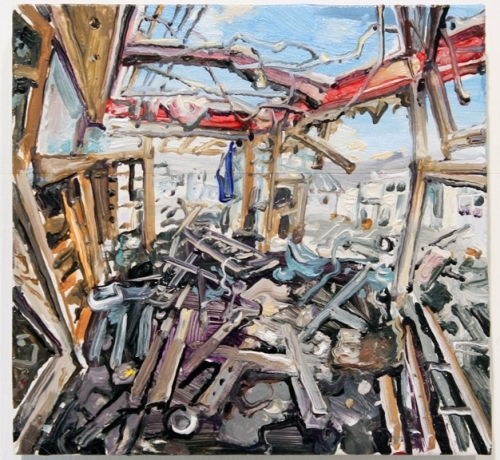 Amer Kobaslija's solo exhibition Amer Kobaslija: Spirit of Place is on view at the Lycoming College Art Gallery. 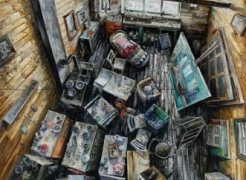 The show features small-scale older, tightly executed oil paintings of Kobaslija's cluttered art studios from a bird’s eye view, along with recent landscapes inspired by travels to Florida, Japan and Switzerland. 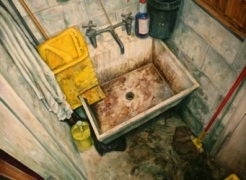 Painted in oil, the seemingly idyllic scenes are charged with turbulent histories. Bosnian American artist Amer Kobaslija's upcoming solo exhibition The Fear of the Unknown opens September 16th at the Galerie zur Matze in Brig, Switzerland and will run through October 22nd. The show is a part of the 2017 Wallis Triennale, a national exhibition which focuses on Swiss art, as well as other European artists. 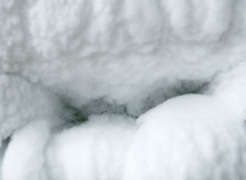 Kobaslija was invited to represent Brig after his residency last year at AiR Brig. 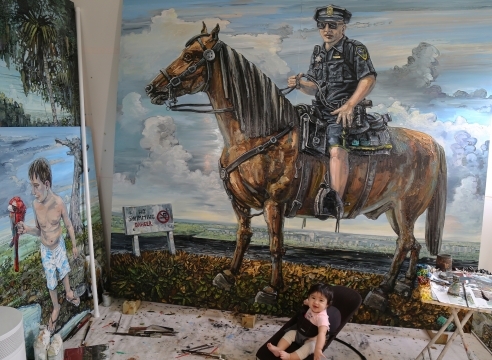 The Ringling College of Art and Design will be exhibiting A 10 Year Survey of Amer Kobaslija's painting in the Willis Smith Galleries from January 15 to Feburary 20, 2016. In conjuction with the exhibition Amer will be giving a presentation on 1/14 and a gallery talk on 1/15. For more information on the exhibition and related events please visit the Ringling Exhibition Calendar. 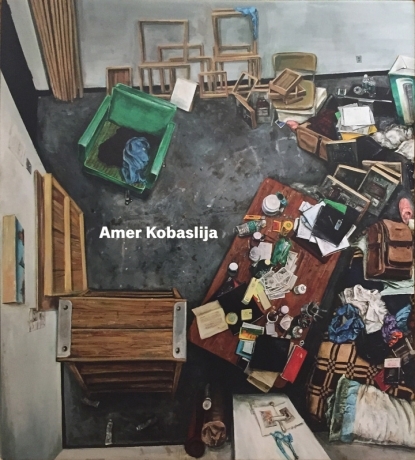 George Adams Gallery is excited to anounce the publication of a new monograph on the life and work of Amer Kobaslija. The books includes essays by Michael Amy, Edward M. Gomez and Patterson Sims in addition to an interview with the artist and 102 color plates. 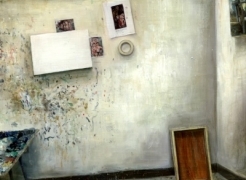 The books exames all of Amer Kobaslija's different bodies of work, including: his paintings of the aftermath of the 2011 earthquake and tsunami in Japan, for which he won a 2013 Guggenheim Fellowship; his ongoing series depicting artist studios; and his recent paintings of Florida's everglades. Copies are available for purchase. Amer Kobaslija and Kako Ueda are both participating in Objects to be Contemplated at the Selby Gallery at the Ringling College of Art and Design in Sarasota, FL. The average art viewer spends 27 secounds looking at a work of art; Objects to be Contemplated examines art which encourages the viewer to spend more time with it. The show runs from Feb. 27th until April 4th. For more information, click here.